Figure 1. Southwest Nebraska winter wheat field devastated by wheat streak mosaic virus. The mites and viruses survive the summer on this "green bridge" and the mites move from volunteer wheat to newly emerged winter wheat plants in the fall, transmitting the viruses. The mite also transmits High Plains virus and Triticum mosaic virus, creating the likelihood of some very severe mixtures of viral infections. The mite depends entirely on the wind for dispersal. In the fall as mite populations increase, they leave the protected areas of volunteer wheat plants (rolled leaves and whorls) and crawl to leaf tips or other exposed areas where they become airborne. After landing on a new host, the mites crawl to the youngest leaf and begin to feed and reproduce. In heavily infested volunteer wheat, most mites will carry the virus, and transmission to the young winter wheat plants requires few mites. Immature mites acquire the virus in as little as 15 minutes as they feed on infected leaves. Mites remain active for most of their lives (two to four weeks or longer with cool temperatures), but the transmission efficiency of adult mites decreases with age. can cost you or your neighbor the value of next year's winter wheat crop due to loss from wheat viruses. can cost you 30 to 100 bushels of corn or sorghum the next year due to loss of soil moisture. can make weed control more difficult and expensive in next year's crop. may make it more difficult to plant the next crop in last year's stubble. The earlier winter wheat is seeded and the longer mild weather extends through the fall, the greater the risk of spreading wheat streak mosaic and other viral infections. Near Ogallala, the winter wheat yield doubled with a week delay in seeding date. Under warm fall conditions, the probability of secondary spread of mites and virus increases, resulting in greater incidence of infection. Reproduction and spread of the mites stop with cool temperatures in the fall; however, mites can survive cold winter temperatures. The virus survives the winter within the plant, and the mites survive as eggs, nymphs, or adults protected in the crown of the wheat plant. As winter wheat greens up in the spring, mites become active and the virus can be spread to healthy winter wheat plants or to emerging spring wheat. One example of wheat streak severity resulted from a neighbor's hailed winter wheat crop across the road; the affected wheat crop averaged 5 to 6 bushels per acre on 320 acres. Yields in nearby areas which had not been hailed and didn't have volunteer wheat yielded 60 bu/ac. Some summer annual grassy weeds also can act as mite and virus hosts. The greater the density of these grasses, the greater the risk. Controlling them will reduce the risk. Volunteer wheat could provide habitat for many other pathogens that may later be a problem if continuous wheat is seeded in the fall. Root rots as well as seedling blights caused by Fusarium species are specific examples. Aphids. Volunteer wheat also attracts the Russian wheat aphid and other cereal aphids. If allowed to remain until the new wheat crop emerges, the risk of aphid infestation and barley yellow dwarf increases. Hessian Flies. 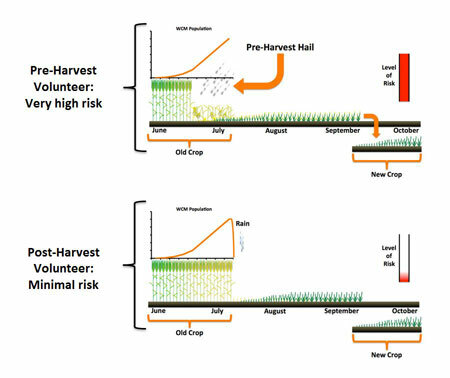 Volunteer wheat allowed to survive through late summer and fall also dramatically increases the risk from Hessian fly. Wheat Stem Sawflies. Some weedy grasses can serve as a host for sawflies. If these weeds are allowed to persist in the environment, their seed production will increase the available hosts for sawflies the following year. This could compound the challenge of managing a pest that is already very difficult to manage. Moisture Loss. Volunteer winter wheat and weeds also use soil water which will otherwise be used by the following crop. The average soil water loss due to volunteer wheat is 3 inches which can result in yield losses of 30 bushels or more in corn or sorghum. Occasionally the loss can be as much as 100 bushels. How does this happen when we only save 3 inches of soil water? With the additional 3 inches of soil water the corn or sorghum crop will survive up to three weeks longer without rain before being lost to drought. Hence, if enough rain is received in time, we have observed yields of 100 bushels or more of corn or sorghum where volunteer wheat and other weeds were controlled after harvest. Increased Weed Seed. Letting weeds produce seed increases the weed seed bank and makes weed control more difficult in the succeeding crops. The weed residue also makes planting more difficult in the following crop. Volunteer wheat surviving through the summer and fall creates numerous risks for the subsequent wheat crop as well as other rotated crops. Controlling volunteer will reduce the risks from these threats and ultimately improve the bottom line.